I was helping out with a youth pheasant hunt this past season and was paired with a father and two sons. Both sons had just finished their hunter safety course, so this was their first hunt. As we hunted, both boys filled their game bags and became excited to eat their pheasant. The dad killed their excitement with a simple phrase. “We don’t eat pheasant; it’s gross,” he said. Both boys hung their heads as we walked back to the car. Being a wild game chef I asked the boys what their favorite chicken dish was; they both replied it was orange chicken. 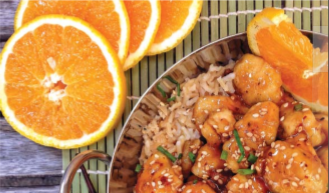 I told their dad that I would create a simple orange chicken recipe that he could recreate with the boys’ birds. I went home and worked for three days until I came up with this dish, a recipe that changed Dad’s mind. Chop pheasant into 1-inch cubes – nice bite-sized pieces. In a plastic bag, mix all dry ingredients, close bag and shake to mix. Add egg to medium bowl and beat until yolk is mixed with whites. Add pheasant and coat with egg wash. Add pheasant to bag in batches and shake to fully coat; remove and set aside until all pheasant pieces have been coated. Let rest for five to 10 minutes. While chicken is resting, add oil to wok or skillet and heat on medium. Once the oil is hot add the pheasant in batches, cooking fully and crispy, about four to six minutes per batch. Once all the pheasant has cooked, set aside and start on your orange glaze. In a small bowl, mix together the orange juice, sesame oil, soy sauce, sugar, white vinegar and zest until sugar is dissolved. Add 1 tablespoon cornstarch and mix smooth, then set aside. Add 1 tablespoon oil to wok or skillet. Next, add ginger and garlic and sauté for 30 seconds. Stir in crushed red pepper and rice wine; stir for 15 seconds to mix. Add orange juice mixture to wok or skillet and bring to a boil, stirring often so as to not burn sauce. Editor’s note: For more on the Wild Chef, Jeremiah Doughty, check out his website (fromfieldtoplate.com), like him on Facebook (facebook.com/Fromfieldtoplate), follow him on Instagram (fromfieldtoplate) and Twitter (fromfield2plate).